The latest issue of The Canadian Friend, our national journal, should be arriving any day for those who are subscribers. This issue includes articles on the 2018 Yearly Meeting in Barrie, reconciliation and faith, Canadian Quakers and the World Council of Churches, pacifist Sufi refugees, and a lot more. The due date for the next issue is February 1. Please submit articles between 500-1200 words long. Submissions on any topic of potential interest to Canadian Friends are welcome. (Unusual topics or word-lengths are possible, but best discussed with the editor before submitting). Photos, artwork, and interesting quotations are also warmly welcomed as submissions. Send submissions to The Canadian Friend‘s editor, Timothy Kitz, at editor@quaker.ca or c/o CYM Office, 91A Fourth Ave., Ottawa, ON, Canada, K1S 2L1. For inspiration, or to take a trip down memory lane, The Canadian Friend back issues are available online. If your library is missing one, you can even download back issues and print them. All members and regular attenders of the Monthly Meetings of CYM are entitled to receive a copy of The Canadian Friend. Donations to defray costs of producing the magazine are gratefully welcomed. 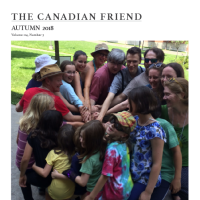 To be added to the subscription list of The Canadian Friend, contact the CYM Office. The Canadian Friend also accepts advertising! For rates and details, contact the editor (editor@quaker.ca, again). Please note that and the committees and bodies of Canadian Yearly Meeting (CYM) do not pay for advertising. Please send print-ready images and clear, readable copy to the editor (again, Timothy Kitz at editor@quaker.ca or c/o CYM Office, 91A Fourth Ave., Ottawa, ON, Canada, K1S 2L1).